Re: City Builder Set Examples? Very nice example! Thanks, folks. I ended up picking up some City packs. I'm going to try to create a solution for other people that had my same question. I'll keep the forums updated! Thanks again! One of several videos on youtube. This is a Village set (with extras) however it gives you an idea. Here are some of my uses of city pieces... wish I had gotten more! Here’s one from our last city adventure. The roof is off the tavern because the PCs were in there. Here's what I hae done with my first Hamlet set, some Battlements, caverns and dungeons tiles to compliment the environment. Thank you, ForestZ! That is the most helpful thing I've come across so far! I very much appreciate your efforts in creating it! And thank you and animesensei for pointing me toward it so promptly three years after the fact! I did look through the Kickstarter page, but they did not have examples of specific pledge levels built out on the main campaign page, only listings of components as on the website here. There was this sentence: "Click here to see a variety of sample set-ups showing various pledge levels with selected add-on sets are outlined in our photo gallery." 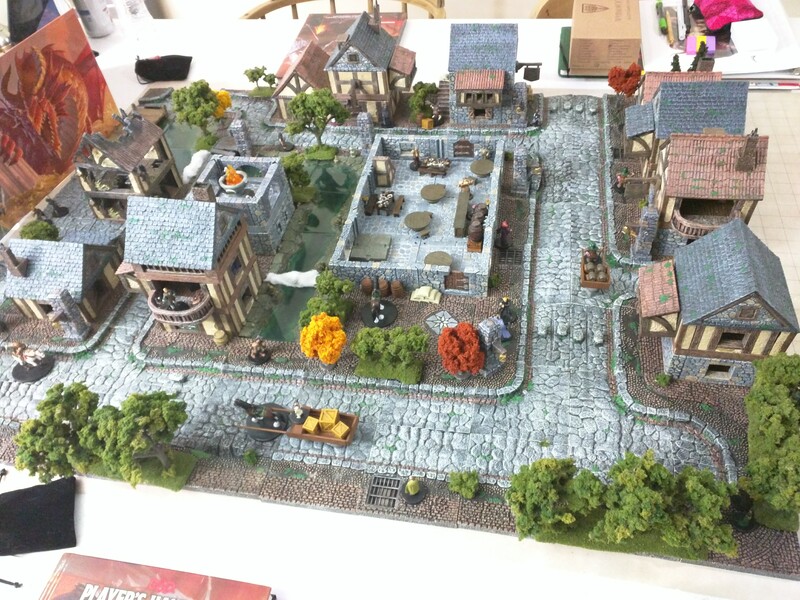 It linked to this photo gallery (https://dwarvenforge.com/kickstarter-20 ... ge-levels/) which did not actually show any sample set-ups. It appeared to be the same (or similar) images of the pledge levels as on the main campaign page. There may be something buried in one of the campaign updates, but I'm hoping someone can direct me here before I have to sort through all those pages. Seems like a very basic thing that should be available somewhere that I'm just missing. Thanks for the links, folks. I'll look through those. But there really aren't pictures showing just what you can build from the various sets available in the shop right now? Seems like an oversight. It was a big complaint during KS3. I tried to highlight as many of the individual sets in the thread AnimeSensei linked above, so hopefully that helps. Many of them include an extra set or two (usually roofs), but you can usually figure out what it would look like without them. I will try that! Thank you kindly. Maybe email chuck@dwarvenforge.com and see if he can send you pics? They might have them saved in a folder and easily accessible.